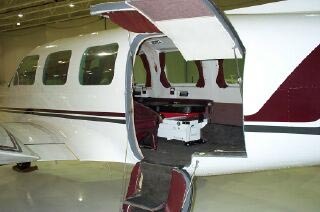 Below the Med-Pac Model 400 air ambulance life support system is installed in a Piper Navajo PA-31 series aircraft. 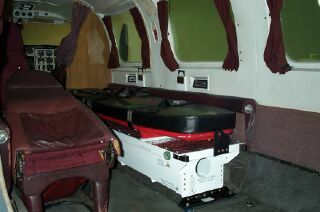 * With a minimal modification to the aircraft, the medical unit mounts to the seat tracks. 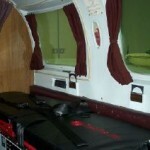 * This fully self contained critical care system is equipped with 3300 liters of oxygen, an air compressor, vacuum pump, inverter, 115 volt ac electrical outlets, 28 volt dc outlet, and pneumatic outlets. 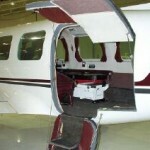 * The quick change capability allows the unit to be easily installed or removed in less than 15 minutes. 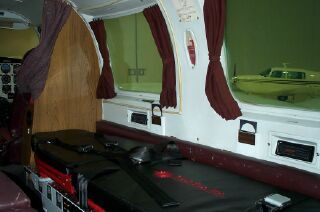 * Our automatic latching stretcher system has an adjustable backrest and a thick foam pad with bacterostatic vinyl covering. 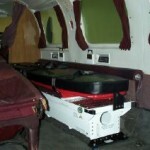 * Make this low profile, light weight, high quality, durable and cost effective design YOUR NUMBER 1# CHOICE for medical transports.